A tanker truck fire and explosion closed I-91 southbound in Rocky Hill for hours and caused some serious damage to the roadway, but authorities say it could have been much worse. 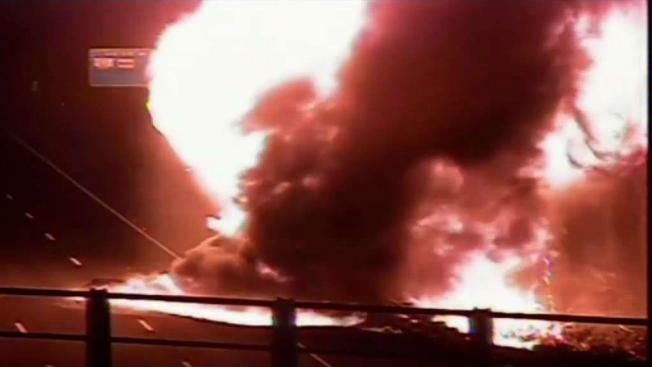 A tanker truck caught fire on I-91 in Rocky Hill, Connecticut, Sunday morning, causing a huge inferno and shutting down both sides of the highway for hours. The fire started around 6:15 a.m. on the northbound side of I-91 between exits 23 and 24, according to police. The truck was carrying 9,000 gallons of gasoline, which fueled the fire for several hours. Because of the size of the fire and the intensity of the flames, firefighters kept at a distance and let the fire burn until it started to diminish. "We were able to get foam onto it after it had burned down to the point where it was controllable," said Frank Kelley, of the Rocky Hill Fire Department. Nearby homes were evacuated due to the amount of smoke. Those residents were able to go to Rocky Hill High School to stay warm, police said. The Department of Energy and Environmental Protection also responded to the scene to monitor contamination to the soil and nearby waterways. "We do have impact to a stream tributary to the Connecticut River. We have booms in place there to try and contain that stream," Jeff Chandler, of DEEP, said. The southbound side of the highway reopened around 8:30 a.m. Some northbound lanes reopened around 1:30 p.m.